Like the speakeasys in the streets of New York during the 20's this beer holds a shady underground complex network of flavours to booze you up. Or something like that, hit guys I am a few deep. 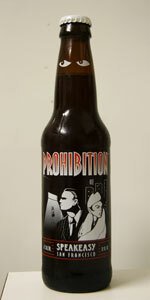 O - I'd drink this illegally if it was during the prohibition. The bottle actually says this is an Amber Ale, and it definitely is by appearance and taste. It's a standard amber ale color, smell is fresh but not hop overbearing. The head is enormous, and stayed through the entire sitting. This is bottle conditioned so those yeast must've been working overtime. The taste is fantastic, fresh hops up front, a little piney, but more citrus. Right after the hops hit you bready malt, with some sweetness takes over and dominates most of the taste profile. This is excellent. Mouthfeel is light, drinkability is almost as good as it gets. Final Verdict: Speakeasy REALLY nailed this one, their Untouchable Pale Ale though missed being at this high level. Had this back in 2007 and haven't tried it since. From the recent reviews I'm seeing I may not try this one again since a lot of people seem displeased with some of the possible recipe changes. I suppose I should be glad I had it a while ago then I guess. The beer poured out as a nice looking amber color with a pretty decent head on top too. The smell of the beer was a little on the light side, there were some hop aromas and sweet malts in the mix also. The taste was pretty nicely balanced between the hops and the malts. The mouthfeel was drinkable and overall I thought it was a pretty good brew. A very good beer. Poured a dark brown with a half inch head. Tended toward the malty side, but with a lingering hoppy bitterness. Pours a true amber color with a very sparse head that fades quickly. Very fast moving carbonation (bubbly looking). At first the smell of caramel takes over the grapefruit hops, biscuit, light raisin and barely present spiciness. Very crisp and smooth tasting with a clean pine, fig, grapefruit and deep caramel play off one another to create a fairly complex dance in a sea of medium carbonation. Feels medium bodied full of flavors that don't overwhelm rather lend complexity to each other to enhance the mouthfeel of this really good beer. This is a must try. You may like it, you may not. You should pick this one up and give it a shot! Served on-tap at the brewery. Good lacing. Clear auburn. The taste is unobjectionable, a kind of malty, nutty, lightly fruity thing. The smell is citrus but the hops are only evident in the scent not the taste. It's a decent beer. But nothing special. I couldn't recommend it. My personal all-time favorite beer. Pours a dark amber color with little to no head. The smell is of hops but is pretty powerful and not that friendly. The first taste is not terrific... the hops takes the most prominent taste but its overbearing: there doesnt seem to be any body to the beer only that of hops. As you continue to sip you become more accustomed to the taste and it evens out, but there is still a little too much water for me. This is a good beer if you plan to have a couple because even though its a microbrew there is still a lot of water to it, but also much taste. Pours a deep copper, thumbnail sized tan foam head, creamy lace. Sweet and malt forward in taste. Very smooth and creamy feel. The finish is hops forward, leafy and dry. Soft carbonation brings out the flavor. A solid and tasty amber ale. Tastes like a descent homebrew. Dry malt flavors, papery and nondescript hop bitterness. Hazy brown color. Pours a dark red-amber into a pilsner glass, leaving lots of irregular foam and lacing. There's a glossy, creme brulée sheen on the surface of the foam, which resembles whipped cream. Smells like strong, fresh hops...grassy, piney, and citrusy. This carries into the taste, which is accompanied by a toasted malt, that has a roasty, bitter finish. It's well hopped, but not overdone. Fairly approachable, seems like it would appeal to most palates, while remaining a creatively crafted ale. Mouthfeel is smooth, carries a sense of round fullness that isn't heavy or thick. Would be easy to have several, it's a shame I only have one single.